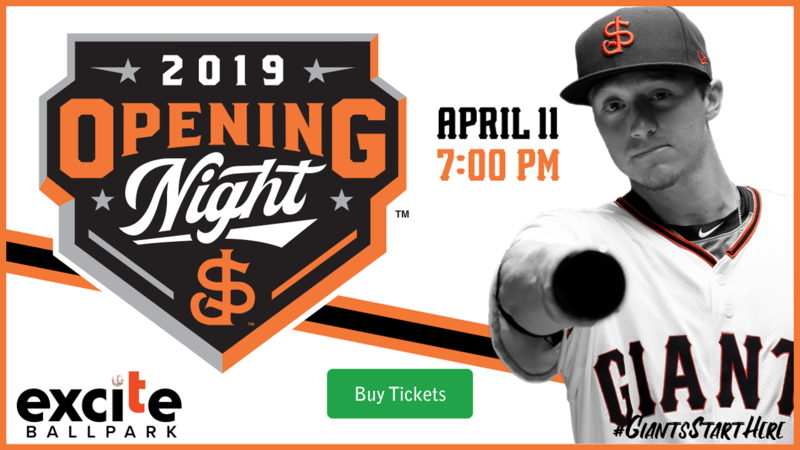 San Jose, CA- Baseball is back in the South Bay as the San Jose Giants host their 2019 Opening Night on April 11. Their weeklong opening homestand runs through Wednesday, April 17 and features two North Division battles against the Visalia Rawhide and Stockton Ports (Oakland A's affiliate). The opening homestand presents Giants fans with an opportunity to see top prospects Joey Bart and Heliot Ramos make their San Jose debut. Homestand highlights include: Opening Night festivities and fireworks on April 11, a 2019 magnet schedule giveaway on April 11 and 12, Salute to the Military Night on April 13 presented by Operation: Care and Comfort featuring a military trading card set giveaway, an Aquafina Pregame Clinic on April 14, Discount Monday on April 15 ($5 General Admission Tickets), Tasty Tuesday on April 16 and Education Day on April 17. Tickets are available now and can be purchased by calling 408.297.1435, by visiting the stadium Box Office or by going online to sjgiants.com. Below is a complete list of events and promotions. Opening Night: Baseball is back in the South Bay! Celebrate the San Jose Giants 2019 season opener at Municipal Stadium with special ceremonies, postgame fireworks and more! Fireworks: The Giants launch the 2019 Fireworks Extravaganza schedule with Opening Night Fireworks immediately following the Opening Night game. Magnet Schedule Giveaway: The first 1,000 fans receive a magnet schedule covering all 140 games of the Giant's 2019 season. Salute to the Military Night: The San Jose Giants and Operation: Care and Comfort present the 8th Annual Salute to the Military Night. The evening features the military trading card set ceremony, trading card set giveaway, and military jersey auction. | Presented By Operation: Care and Comfort. Military Jersey Auction: The San Jose Giants will wear special military-themed jerseys which fans can bid on. The auction, which benefits Operation: Care and Comfort, begins on Salute to the Military Night and ends on Memorial Day. | Presented By Operation: Care and Comfort. Aquafina Sunday Funday: The San Jose Giants and Aquafina have teamed to present a Sunday Fun Day 4-Pack which includes: 4 tickets, 4 hot dogs, 4 Aquafina or Pepsi soft drinks all for just $44! Visit sjgiants.com/tickets and enter the promo code AQUAFINA to redeem this special Sunday Fun Day 4-Pack at checkout. Must pick up tickets (hot dog/soda vouchers attached) at Will Call. Discount Mondays: Every Monday, General Admission tickets are now just $5! Enjoy the most affordable entertainment experience in the South Bay all summer long. Motivation Mondays: Get motivated and start your week strong with the San Jose Giants and Valley Health Plan every Monday throughout the season. Tasty Tuesdays: Every Tasty Tuesday enjoy a special ingredient featured in menu items throughout the ballpark courtesy of the renowned Chef Mijares. Bon Appetit! Education Day: Education Day offers a unique opportunity for students and teachers to enjoy an exciting learning experience at the ballpark. Education day features educational S.T.E.A.M. booths, a pregame mock press conference and more! Wine Walker Wednesday: It's a special vino-spin on the Beer Batter! Every Wednesday, a selected Giants batter is designated the Wine Walker. If the Wine Walker reaches via base on balls, fans can enjoy half-off wine for 15 minutes. Watch on MiLB.TV: The San Jose Giants are on MiLB.TV for the 2019 season. Fans who cannot make it to Excite Ballpark can now enjoy all San Jose Giants home baseball games for a monthly subscription of $12.99 or purchase the yearly MiLB.TV subscription for a price of $49.99. Use the promo code 'GIANTS' for an additional $10 off. All home games will be streamed live and are available on demand. With a subscription fans will also receive access to more than 5,500 Minor League games so that they'll never miss a pitch, a prospect or a promotion. For more details and to sign up for the subscription, fans should log on to sjgiants.com and click on MiLB.TV. Streaming Live: Every Giants game can be heard live on the San Jose Giants official website at sjgiants.com. Joe Ritzo is behind the microphone as the voice of the Giants. Fans can also find team information such as updated rosters, statistics, game notes, and news by visiting the website. Listen at the ballpark on 92.9 FM: Listen to the game at the ballpark. Tune into 92.9 FM inside the main seating bowl at Excite Ballpark to listen to the live radio broadcast.